Accommodations on bed & breakfast twin-sharing basis in Bishkek, accommodations and three meals a day outside of Bishkek, airport transfer service, all land transportation and scheduled sightseeing tours, trip leader, English speaking local guide and support staff, fully organized trekking/ camping services, first aid kit and museum entry fee..
International flights, emergency evacuation (if needed; travel and medical insurance are also not included, and are recommended), personal medical kit, international airport taxes, excess baggage, sleeping bag, alcoholic and bottled drinks, optional tips to staff, and items of personal nature/misc costs. Selected by Outside Magazine as "Trip of the Year"
The Central Asian Republic of Kyrgyzstan offers some of the finest trekking in the world, combining spectacular mountain scenery with the fascinating lifestyle of the nomad herders. Every summer the Kyrgyz people drive their livestock to the high mountain pastures, called “Jailoo,” where they live in traditional felt yurtas, produce wool felt carpets, and make a fermented drink from mare’s milk. Your days in Kyrgyzstan will be spent hiking amidst the wildflowers and alpine meadows of the Tien Shan range, camping near crystal-clear lakes or beside nomad camps, observing first hand how these hardy people live. This trip is specially planned to coincide with two cultural festivals that show off the national cuisine, ancient oral folklore traditions, and incredible horseracing skills of Kyrgyzstan. You’ll also stay with families trained in homestay operations as part of a community-based ecotourism program with which KarmaQuest owner Wendy Lama is assisting. 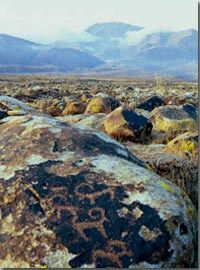 Kyrgyz culture is rich and vibrant: you’ll see demonstrations of women making the colorful shyrdaks (felt carpets), visit an amazing archaeological site with 8th century petroglyphs (see photo left), and learn about the communities’ efforts to build the rural economies after the collapse of the Soviet Union support system. A refreshing stop at natural mountain hot springs, and an overnight on the shores of Issyk Kul Lake promise true relaxation. The capital city Bishkek, framed in snow-capped mountains, offers a wealth of shopping for colorful Kyrgyz handicrafts, a fine international cuisine, and friendly Kyrgyz people amidst parks and tree-lined streets. Day 1-2-3 Travel to Bishkek. Arrive early morning. Rest at hotel. City tour. Day 4 Bishkek to Cholpon-Ata Visit Osh Market. Drive (300 km/187.5 miles) east across Kyrgyzstan’s scenic high pasturelands to Issyk Kul (Lake), at 1609 m/5300 ft elevation. Overnight in a guesthouse. Day 8 Trek Cross Tilety Pass (3800 m) – 3 hours -- on foot, bringing you to the Karakol Gorge. Continue another 10 kms/6 miles along an ancient nomads' path leading to a tented camp near a traditional, nomads' rest spot. Day 9 Trek Continue hiking amidst this spectacular mountain scenery (8 km) from Karakol Gorge to the “Orphan” mountaineers' shelter. Stop in the shelter for a rest and lunch. Camp in tents. Day 10 Trek to the Ala-Kul Mountain Lake (3600 m), more than 70 meters deep and of incomparable beauty. From the lakeshore, you can see a spectacular glacier -- the source of the milky blue lake waters. Cross the pass Ala-Kul (3860 m / 12,660 ft) in the afternoon (4 hrs), Camp in tents (3100m/10,168 ft).Camp near lakeside. 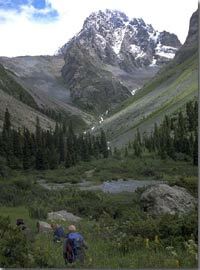 Day 11 Trek 4 hours to the Altyn-Arashan resort (2450 m), and relax in natural thermal baths. After lunch, transfer by vehicle to Karakol. Overnight in a guesthouse. Day 12 Karakol/Kochkora Enjoy a leisurely morning, and the sights of a Karakol city tour. Drive 270 km to Kochkorka, where you’ll overnight in a family run accommodation. Day 13 Kochkor to Song Kul Visit a felt carpet workshop and participate in making your own felt carpet, or shop for carpets and souvenirs made by local women. Then drive from Kochkor to Song-Kul Lake (150 km), one of Kyrgyzstan’s loveliest mountain lakes. 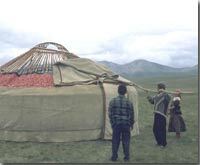 Stay on the shore of Song-Kul in a yurta, the traditional home of the nomadic shepherds. Day 14 Trek Drive (about 60 km) to the starting point of your second trek and continue by foot, enjoying an impressive view of Song-Kul and the surrounding hills. Camp in tents. Days 15-17 Trek (3-days) through the Moldo Too mountain range along a trail used by ancient nomads. The path goes through valleys and passes from 3400 m to 3700 m above sea level, through flower-covered meadows and mountains inhabited by Lammergeyer vultures, where herds of horses, cows and sheep graze around the herders’ yurtas. Camp in tents on trek. 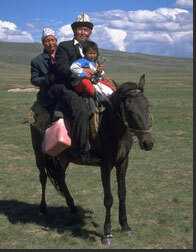 After the trek transfer to Naryn (200 km), and overnight in a guesthouse or family accommodation in Naryn. Day 18 Drive 400 km/250 mi back to Bishkek. Rest and relax, overnight in a hotel. Day 19 Sightseeing and shopping in Bishkek.